Thanks to First NBC Bank, officers of one of the Department's Uptown districts (the 6th) will get their own alt-policing method: the segway. 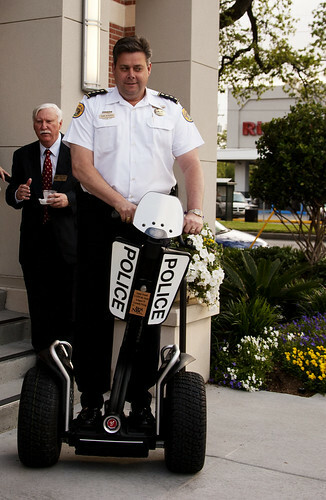 NOPD Superintendant Ronal Serpas rode the new crime-fighting segway last night at the ribbon-cutting ceremony of First NBC Bank’s new branch opening in the Garden District. After riding it quickly and confidently across the bank’s parking lot, Serpas talked about how it differs from the average tourist Segway carrying Midwesterners through the Quarters. “It has a bigger battery capacity," he said. "The wheels and structure are stronger." Though the city has problems like potholes, Serpas believes the Segway’s customized larger wheels are “capable of a lot of terrain that you might not expect." In the photo below (also via NOLADefender) Serpas demonstrates the super-Segway's enhanced strength when pushed to the extreme limit of its carrying capacity. It was only a few short months later that Serpas deployed an even more impressive piece of technology. On Friday afternoon, the New Orleans Police Department and Chief Ronal Serpas will be unveiling the newest weapon in their crime-fighting tool belt: a $350,000 mobile DWI unit the NOPD has christened the "Batmobile." Purchased through a grant from the Louisiana Highway Safety Commission, the Drunkmobile Batmobile is a 38-foot long mobile unit with room for four citizens to cool their heels while a fifth blows into a tube in the rear of the vehicle. Holy high-tech drunk tank, Batman! Look for it at a DWI checkpoint near you. But even as his department has benefited from new technologies, Serpas has run into difficulty maintaining the manpower necessary to operate it. According to a status update to PANO's Facebook page, though, it sounds more like the city is running in place there. Oddly enough, in the midst of the hearing, CAO Andy Koppelin (sic) appeared and stated the City may still have to impose layoffs and LWOP days depending on the cost of the pending consent decrees. That bit of info would seemingly alarm any potential applicants, as well as current employees. But, hey, the good news is they're buying new tech. The "future of American law enforcement" begins when every interaction you might have with a police officer.. no matter how insignificant.. is recorded by a law enforcement camera and fed into the burgeoning security panopticon. How exciting! Are you excited? Serpas said the body cameras are a major step that other police agencies across the country have embraced, both to protect the public and to forestall false complaints against officers. See? It's exciting. But this vision of Segway and Google Glass powered Batcops is really just a way station on the path to a better future where we can dispense with manpower altogether and just move straight ahead with the all-drone police force we've been waiting for. Will sure save a lot on pensions that way.